This past year I’ve really been sewing a lot. 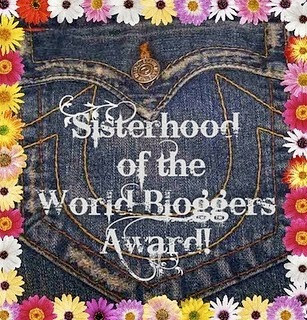 I actually think this would be the year when I made the most clothes and crafts ever – including my 4 years in fashion/sewing school. Basicly I think the most of my sewing inspiration this year have ben due to the HSF challenges – which not only made me whant to make stuff, but also made sure I did finish them in time. So lets do a round-up of all the little things I’ve manadged to make during 2013. 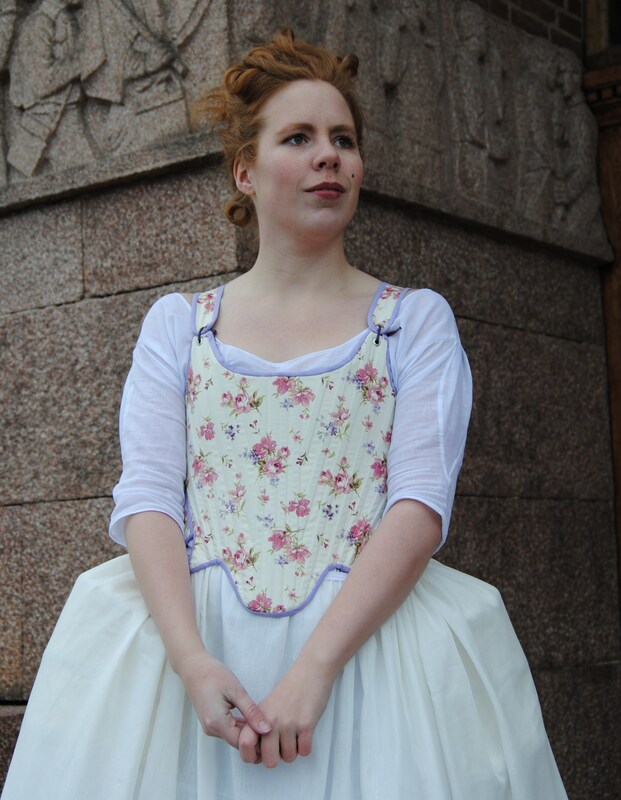 1770s Corset A corset and petticoat for my sister who been wanting one for ages. 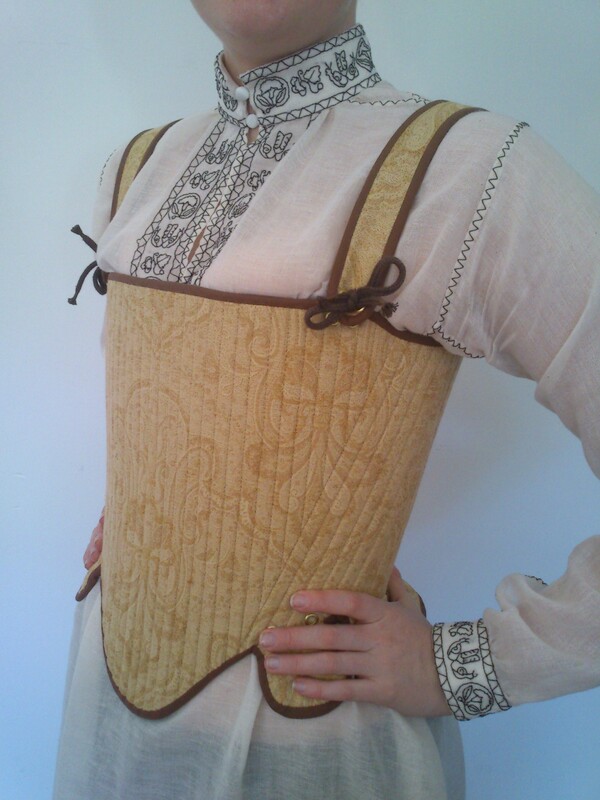 1580s Corset and Shift Blackwork emelishments on a shift. 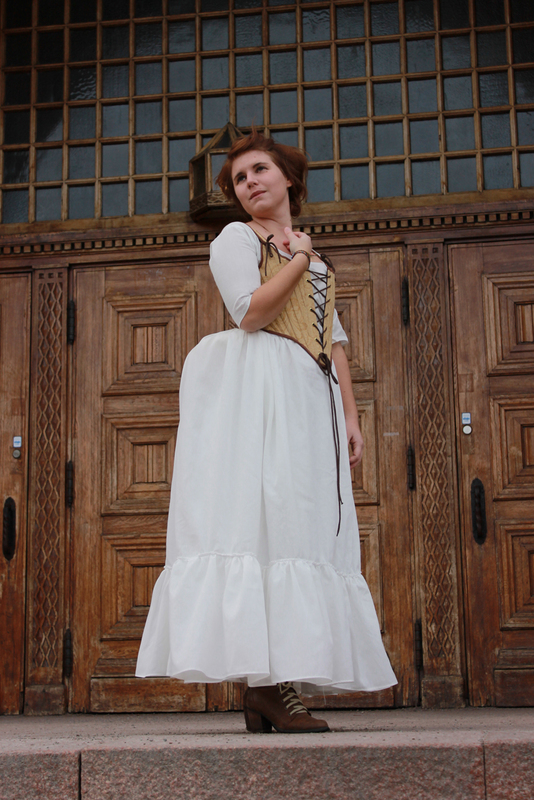 I also made another shift and the gold/brown corset to be used under a planed renesance dress. 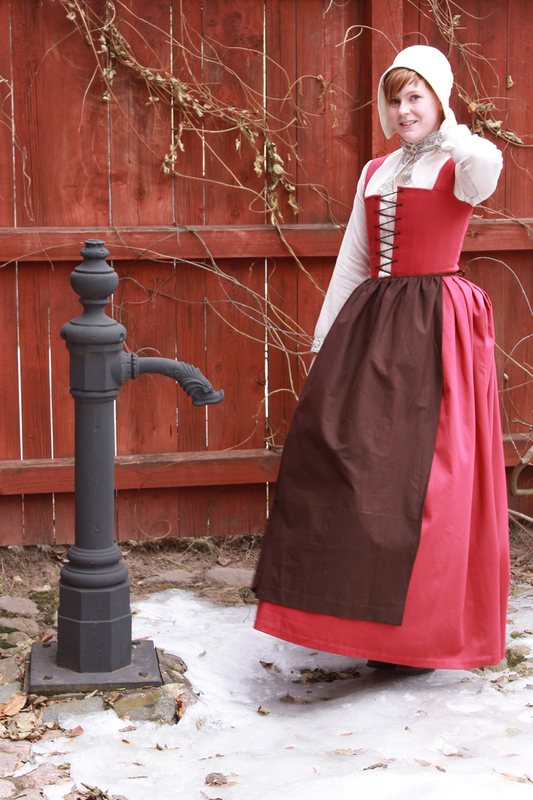 1550s Peasant Gown A peasants costume containing a red kirtle, a brown apron and a white coif. Regency Gown and Accessoares Regency dress in pale green, and some accessoares like white mittens, green turban and a sheer fichu. Worn to “Mickelsmäss” Party and dance show. 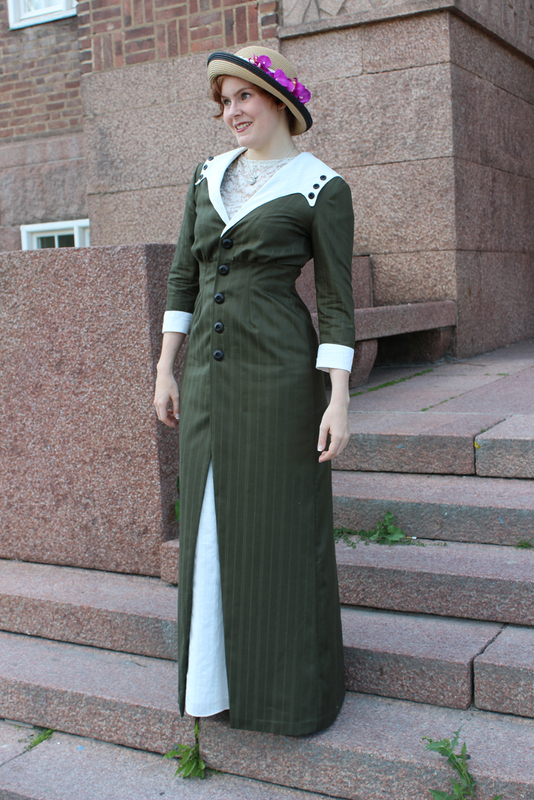 1930s Dress A Sailor dress in green/white cotton, and a straw hat to match. 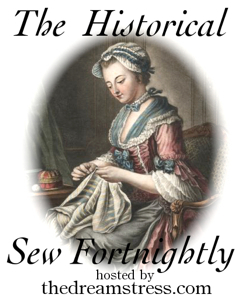 1780s Gown A Robe a la Anglaise in flowery polyester sateen. The dress was a pain to make but it did turn out great (dress construktion part 1, part 2.). 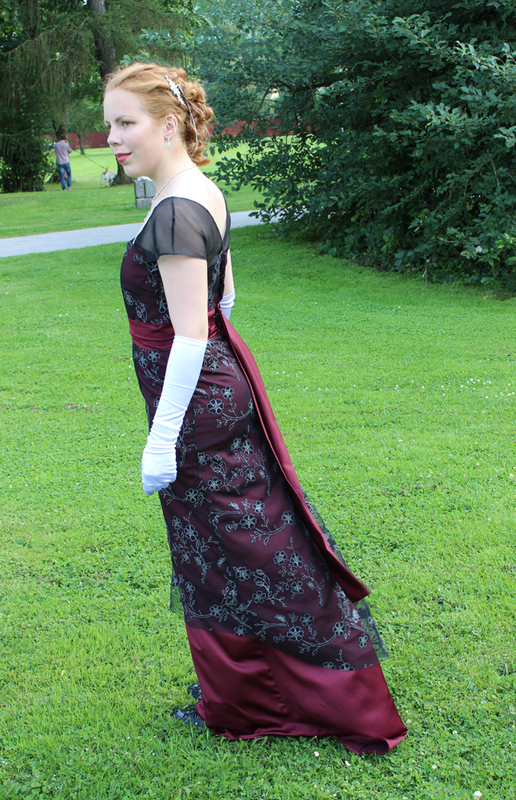 I also made the Bergere hat and had a photoshoot of the dress. 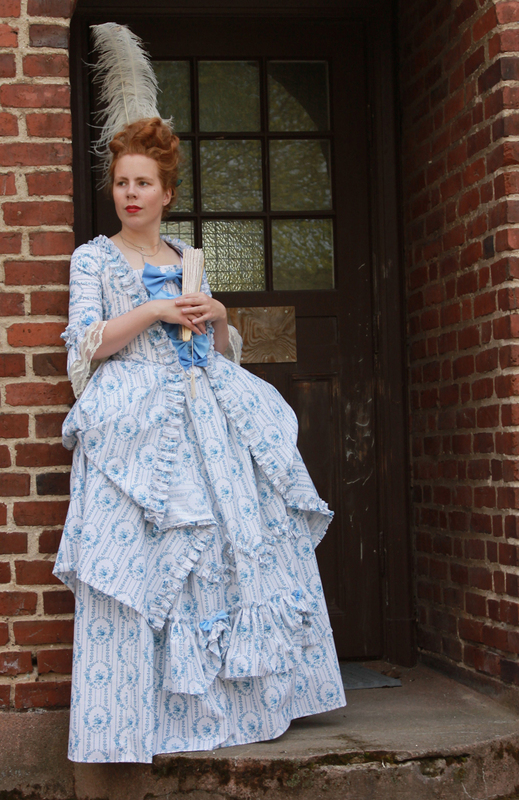 1770s Gown The white/blue flowery Robe a la Franchaise to go over my sisters corset. And the pictures from the photoshoot. 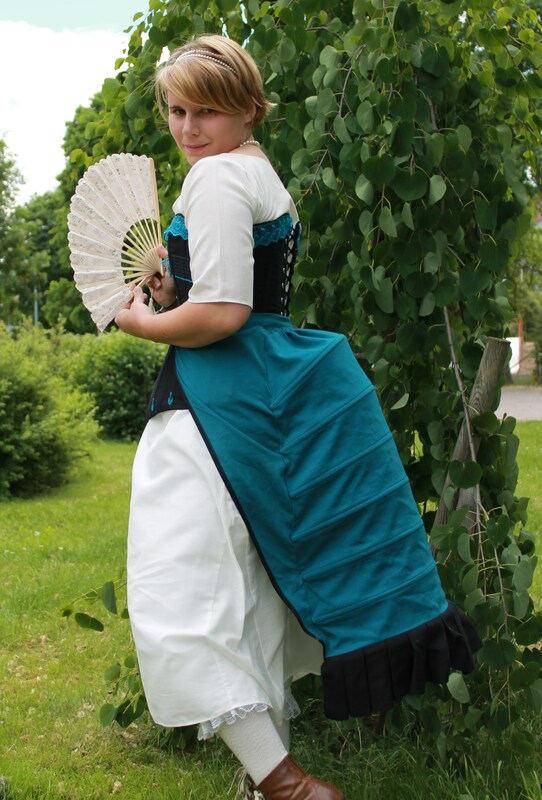 1760s Skirt/Petticoat This skirt/petticoat is so useful. I’ve worn it under several other dresses – to get some extra bounce and for warmt, and it even looks pretty on its own. 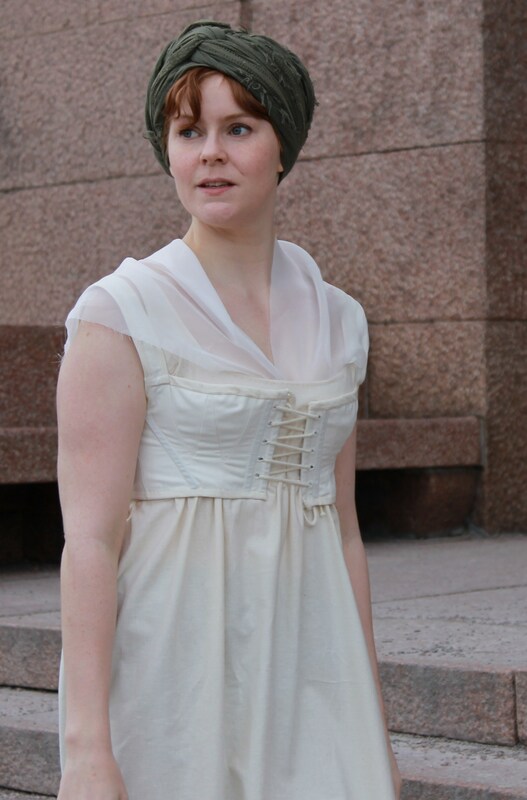 1780s Chemise Dress A Chemise a la Reine inspired by the princess Lamballe. This dress is so comfortable and easy to wear it’s a shame I only have worn it once (yet) (to a picnic,) apart from the photoshoot. 1880s Underwear A late victorian Corset and Bustle for my sister. We had a blast taking photos both Historical and Punk-Victorian. 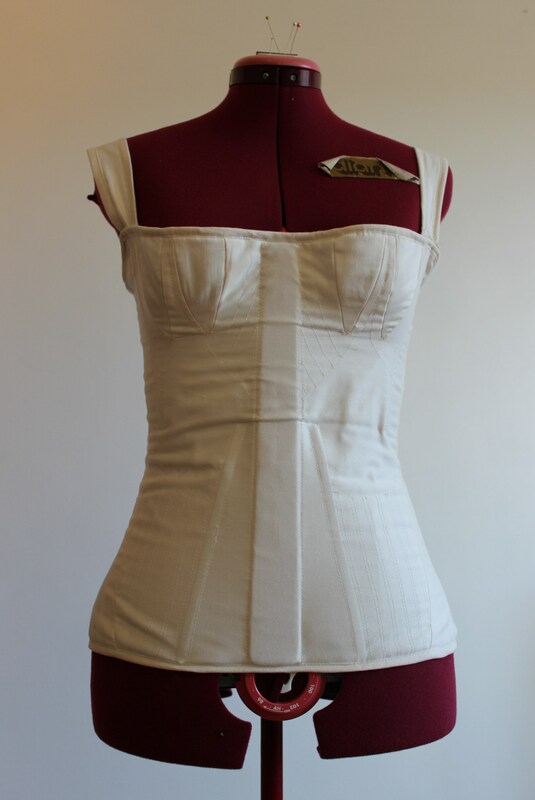 1910s Corset A early 1910s corset made to be worn under some Titanic era dresses. 1913 Day Dress A 1913 Daydress and hat made to be worn at the Titanic exhibithion. I also made a pattern for this dress. 1913 Evening Gown A 1914 evening gown in pistage green organza. 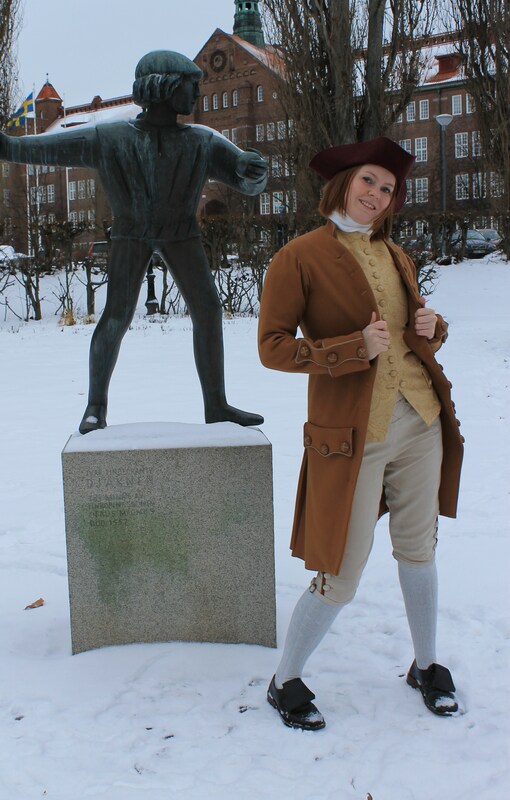 1750s Ensamble A 1750s striped Pet-en-l-air jacket and a gold colored skirt, worn with a cap/hood in sheer cotton. And pictures from the photoshoot. Regency Corset I really needed a real Regency Corset to use during a “Jane Austen” dance performance. Medieval Gown I made this outfit for a Medieval Fiest in November. 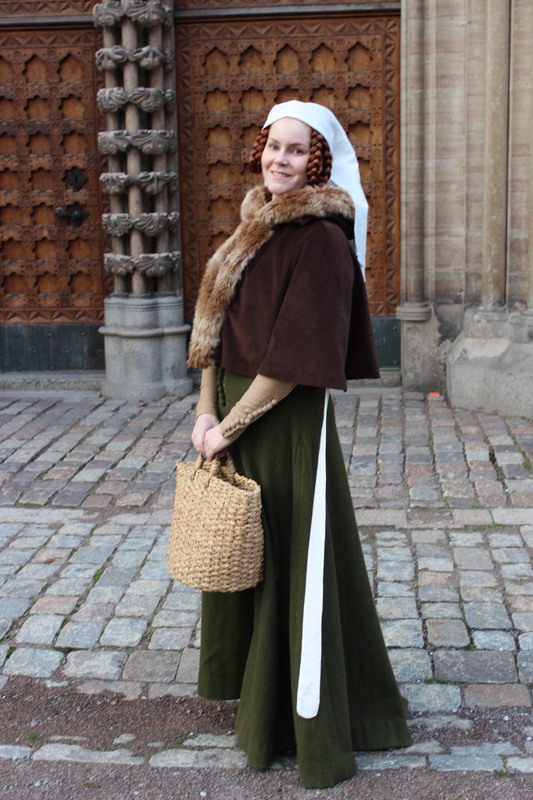 It contain a Green Medieval Gown in thick wool, a pair of beige woolen Faux Sleeves, a fur trimmed brown velvet Cape and a white linnen Headcoth. 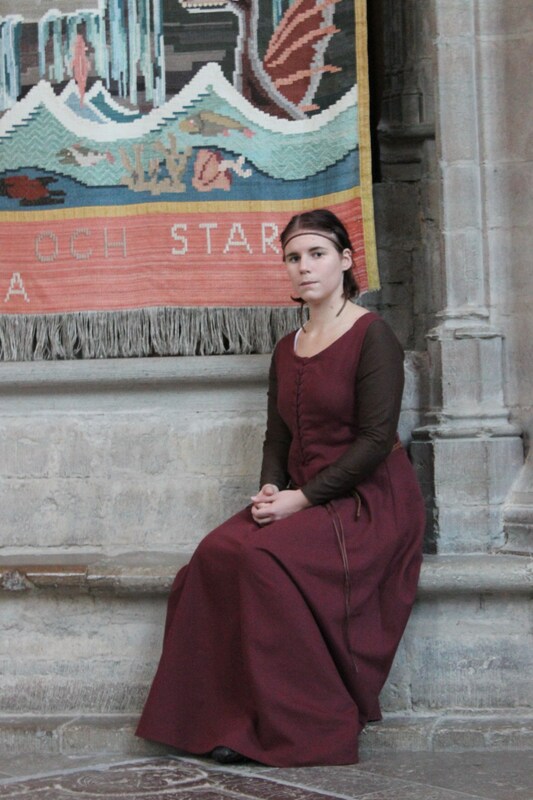 And of couse pics from the Medieval Photoshoot. 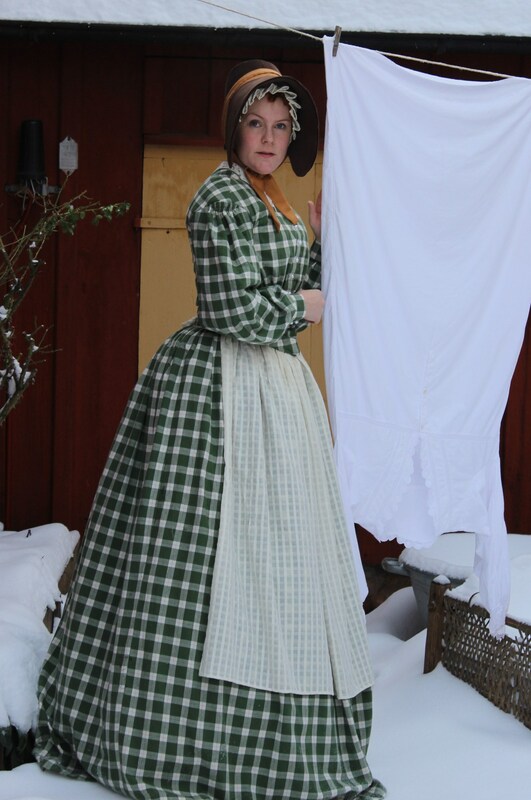 1840s Day Dress A 1840s dress used at a 19th century Christmas Party. 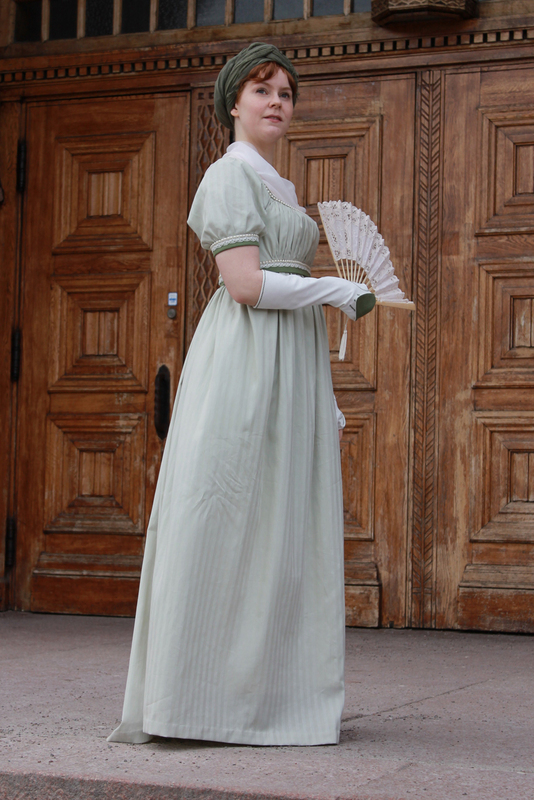 The Dress is a green cotton plaid, worn with a cotton Apron and a brown velvet Bonnet. 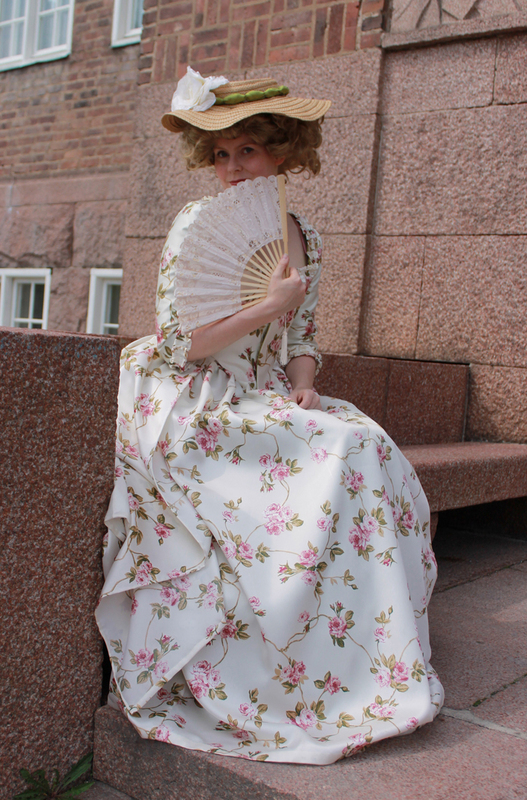 And pics from the 1840s Photoshoot. 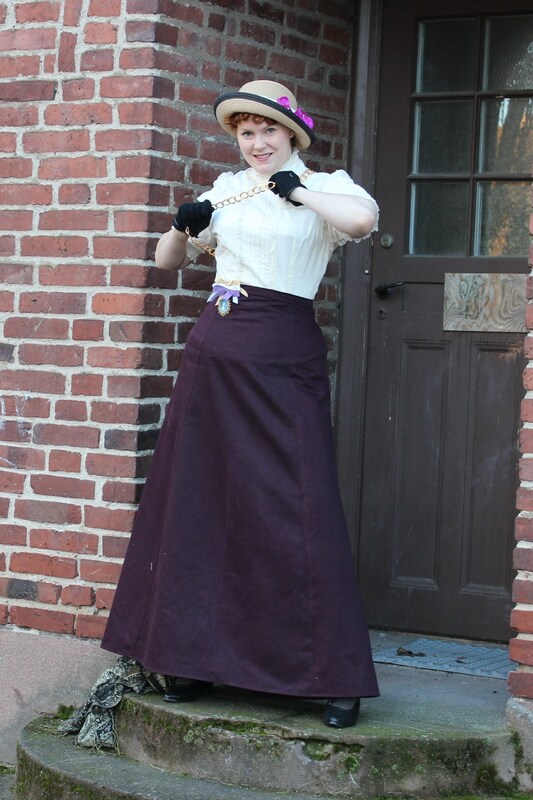 1900s Suffragett outfit A 1900s shirtwaist re-modeled from a modern blous and a skirt in cotton twill, worn with a golden chain and brosch to make a Suffragett outfit. And thats the re-cap of my HSF13 items. The total amout count as: 5 Corsets, 3 Chemises/Shirts/Blouses, 1 Bustle, 6 Skirts/Petticoats, 10 Dresses, 8 Hats/Headwear, 1 Outerwear, 7 Accessoares. And then we have the other clothing items of this year. 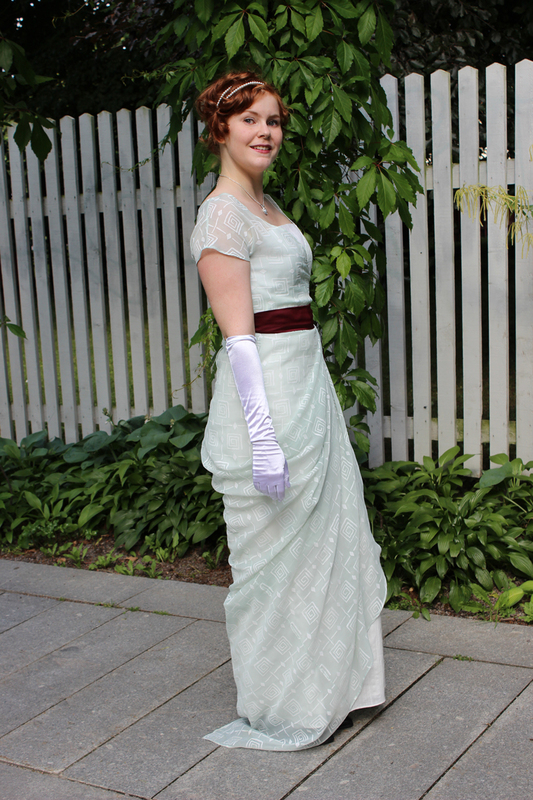 1910s Evening Gown A 1910s evening gown made for my sister to wear at a Titanic event. Mother of the bride dress A dress and jacket made for a costumer to wear at a wedding. 1930s Dress A dress made from a picture of a girl living in the house in the backround. 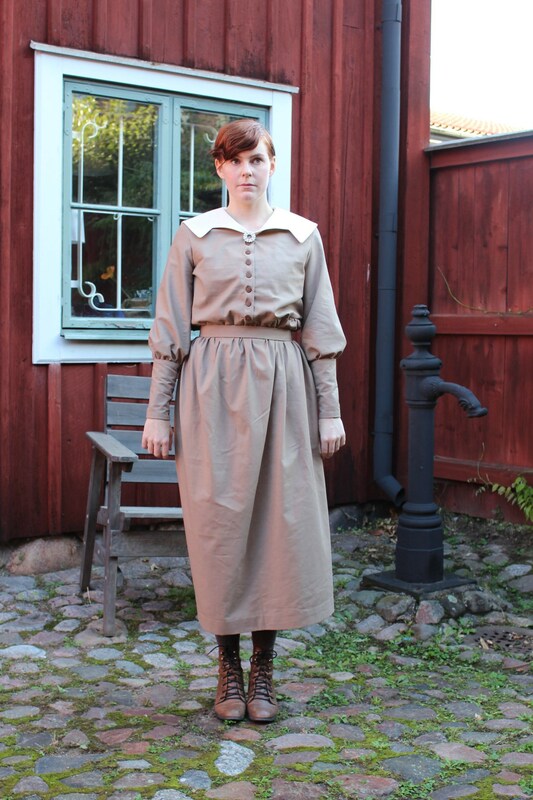 I made the dress as part of a exhibithion of the houses and how people lived in the 1920-1930s. Medieval Gown A dress sewn to my sister in about 10 hours, for a Medieval party. Not to bad for one years worth of work. Well, I do plan to continue the sewing into next year, even though I think I need to reduce the pace a bit (and not keep going at this crazy speed). Today was about what’s been done, tomorrow (or next post) will be about whats coming (hopefully) in 2014.